Should insulting religion be banned? The reason the idea is still debated in the 21st century is that it has been reframed as a debate within liberalism rather than against it. The arguments set forward by groups such as the Organisation of Islamic Cooperation (eg) nowadays have a liberal sound to them: Freedom from Harm; Anti-discrimination; State Neutrality; and Tolerance. But in fact they are not liberal at all. They do not respect individuals, nor are they compatible with a free society. The argument: Insulting a religion harms its followers because it is an assault on something people care about deeply. Liberalism is committed to the principle of reciprocal respect for everyone else's interests, i.e. no one has the right, simply as an exercise of their own freedom, to harm anyone else. Restrictions on harming others are therefore not illiberal, but follow from core liberal principles. The mere existence of harm is not a sufficient reason to create a legal ban. We live in a crowded world with complicated interactions that often have unintended consequences on third parties. If I drive to work I may make everyone else slightly later; if I invent a better car engine I may ruin my competitors and put many thousands of people out of work (while providing new jobs for others). And so on. There are very good practical reasons to develop a legal framework of rules for adjudicating the conflicts that come with social living. But such a system has to acknowledge that banning harm to others is a foolish and illiberal goal. Foolish because one cannot have a thriving society, or even much of a society at all, without people bumping into each other. Offense is a particularly problematic harm because it is so subjective: feeling you have been offended becomes self-legitimating evidence that someone else is guilty of harming you and deserves punishment by the state. Bans on subjective harm give every private individual an unaccountable veto power over what everyone else is allowed to do, i.e. the power to make laws. We would have a society of dictators whose power over others is mirrored by their own lack of power to do what they want. Illiberal because it does not reflect the core commitment of liberalism, which is not the avoidance of harm or even the promotion of aggregate happiness but the promotion of individual autonomy, maximising our freedom to live our own lives for ourselves. First, maximising freedom means the greatest number of people having the greatest freedom possible, in the sense that individuals' rights are as expansive as is compatible with everyone else having the same rights. As Kant would have it, others can give themselves ends (goals and values) just like you, and therefore that somewhat transcendental capacity should be respected in others too. Second, these rights should be evaluated in terms of their fundamental purpose. Specific rights associated with liberalism - of conscience, property, speech, association, equality before the law, and so on - all follow from a foundational commitment to respect the individual autonomy of all, which is our ability to govern our lives, including our moral and religious lives, by rules we set ourselves. When there appears to be a conflict between rights, as in this case between freedom of speech and freedom of religion, it is to this core liberal commitment that we should refer. Once we do so we can see that not all harms are equal. Harms to your autonomy, your ability to govern your own life, are more significant than harms to your happiness or self-esteem. For instance, it may be true that the existence of gay marriage (or even gay people) is deeply outrageous and disgusting for very large numbers of people. Yet gay marriage doesn't undermine the autonomy of those who hate it in any meaningful way. Rather, it is banning gay marriage that clearly undermines individual autonomy, since it prevents many people from living the kind of lives they have reason to value (surprisingly enough, in radically conventional domestic arrangements - previously). Liberalism argues that how gay people manage their personal relationships is no one else's proper business. If you think it is your business and get upset about it, that is your problem and not their fault. Likewise, on the face of it, autonomy is not threatened by blasphemy. No one is being prevented from being a practising Muslim/Christian/whatever by the fact that somewhere on the internet someone disagrees with their religion, or that Salman Rushdie wrote a novel that some people say is rude about Mohammed. The only infringement of autonomy in play is the demand to censor those found insulting. Third, even if one only considers freedom of religion, one will still be unable to justify a ban on religious defamation. To be understood as a liberal right, freedom of religion must be construed as requiring freedom of religion for everyone, i.e. reciprocal respect for the freedom of religion of other people. Yet unlike the right to practise one's own religion, the 'right not to be offended' is not a right that everyone can have at the same time. This is because religious defamation basically means blasphemy, but blasphemy is defined relative to a particular religious group. In a society with freedom of religion, there will be a diversity of religious groups with contradictory beliefs. There will also be internal diversity within each official group. Because individuals are free to take up any of these, freedom of religion automatically produces believers with contradictory beliefs, i.e. heretics. Since the public affirmation of one's religious beliefs is an intimate part of what it means to be free to follow the religion you consider true, heresy produces blasphemy. Consider for example the Muslim protests about Pope Ratzinger's Regensburg Lecture, or, at the inter-sect level, Sunnis' condemnation of blasphemous Shiite beliefs or Protestants' condemnation of Mormonism. In other words, one sect's orthodoxy is another sect's blasphemy. One cannot say what constitutes religious defamation without deciding which religious denomination deserves the most respect, which is a political decision. The other side of that coin is disrespect for the freedom of religion of heretics, and their oppression in the name of the religious sensitivities of the politically dominant sect. And this is in fact how blasphemy laws are always used. The argument: A liberal society protects its members from persecution by state or non-state actors. That includes systematic attacks on aspects of their identity intended to induce fear or to undermine their equal status as citizens (or even as human beings). Many attacks on religion are in fact attacks on the people associated with those beliefs, often an ethnic minority. In France for example, and similarly elsewhere in Western Europe, mockery of Islam serves as a way of questioning and undermining the Frenchness of citizens of North African descent (even though most are not especially religious). But notice that the reason this seems more plausible than the subjective offense argument is also what makes it harder to use to justify a general law against blasphemy. Evidence of feeling like a victim is not sufficient here. What is needed is objective - testable - evidence that the social standing of some group of people has in fact been deliberately attacked in some significant way. Hate speech legislation is about protecting people from persecution, not protecting people's beliefs from challenge or pollution. Merely having your beliefs criticised (what do headscarves have to do with the Koran?) 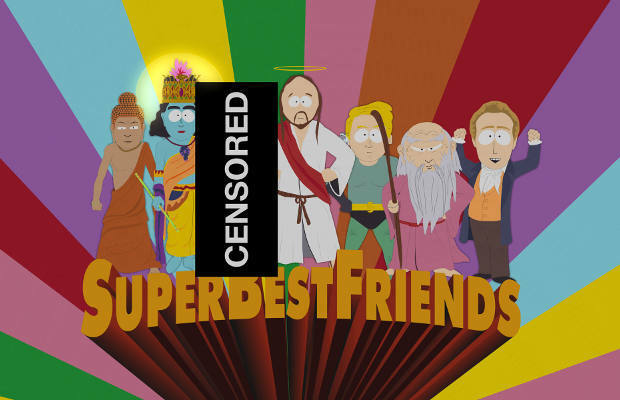 or even ridiculed on South Park doesn't cut it. Nor can it include other people merely practising their own beliefs, like the evangelical atheists going around saying 'You're deluded. God doesn't exist'. The hate speech model would thus only cover a small set of the present complainants about blasphemy. There are particular difficulties applying it to material published on the internet and accessed around the world from where it was produced, as in the case of the Innocence of Muslims filmlet or the cartoons published in Denmark's Jyllands-Posten. The world map of outrage has little overlap with the world map of vulnerable Muslim minorities. The self-publishing character of the internet, combined with efficient search engines like google, produces the novel effect that nearly anything one puts there can be found, stripped of its context, by the very person you would least like to have see it. Anyone who wishes to can easily find something that offends them to the very core of their being on the internet. The corollary of this is that such offensive self-expression cannot really function as hate speech in the traditional sense. People are not subjected to it in inescapable ways, such as on their televisions or through their letter boxes. Instead they must deliberately and consciously search for it. Nor is it readily linked to a political or social bullying campaign against a minority. I find it difficult to sympathise with the outrage that some people make themselves feel about stuff on the internet, or to see how a youtube video that offends you is necessarily an attack on your equality. The argument: The liberal state is supposed to ensure equal protection and equal opportunity to all in living according to their own conceptions of the good. That requires neutrality: taking no position about which values are right or wrong, good or bad. It follows that a state that permits people to insult others' most foundational beliefs is failing in its duty of neutrality because it does not extend equal respect and protection to believers. Permitting blasphemy is like supplying weapons to your favourite side in a war. This argument is confused about the character of liberal neutrality. To be precise, it confuses principle neutrality with operational neutrality (Alex de Waal's distinction, in another context). Principle neutrality means assessing all sides in a dispute objectively and neutrally according to the same principle. Operational neutrality means refusing to take sides in any dispute. Clearly these are quite different and one cannot have both. To make this clearer, consider the TV show, The Newsroom. The central theme is whether journalism is about objectivity (informing people about important facts) or balance (providing 'both sides' of every story). The Newsroom takes an ethical stand: real journalism is about objectivity not balance. Likewise, liberalism is not about balance. It does not consist either in abstaining from moral judgement or judging that all beliefs or value-systems are equally good. To the contrary, liberals believe that liberalism - respecting and supporting individual autonomy - is best. The perception that liberalism is about balance may have something to do with liberalism's expansive toleration of strange and even obnoxious behaviour and values. You are free to practise Satanism, for example, or that one that involves covering yourself in sacrificial chicken blood. Yet the freedom to be strange is actually quite consistent with liberalism's principled neutrality about upholding individual autonomy. Those seeking to ban blasphemy argue that the liberal state should not only positively guarantee everyone the freedom to practice their religion but be operationally neutral about the content of their beliefs. They therefore demand tailored packages of rights and freedoms for people who believe their religious beliefs have special requirements. For example, supposedly all 1.5 billion Muslims believe that pictures of Mohammed are sacrilegious. Therefore the state, in order to respect the equal right of Muslims to practise their religion, should ban depictions of Mohammed. But while the liberal state has extensive responsibilities for respecting and supporting individual autonomy, that does not extend to respecting the autonomy of religious/moral beliefs themselves (e.g. that Mohammed's face never be shown, or that cows not be eaten). People have dignity, ideas do not. Frankly, it's like expecting parents to take their children's beliefs in the autonomous existence and needs of their favourite Disney characters seriously. Needless to say, the liberal state is not your mother. The liberal state is a product of the Enlightenment. It is supposed to treat us like grown ups, not children who need humouring. So it seems to me that the demand to ban blasphemy is not really a demand for neutrality in either sense, but for special treatment of some particular religion(s). The justification seems based on mysterious claims by people whose authority to speak for all those people is equally mysterious, first about what that religion considers sacred, and second about the special significance of this in the lives of all its adherents. The argument: A liberal society is a society, not merely a collection of individuals with rights who permit others to also exist. Tolerance is the first virtue of such a society. For liberalism to work and flourish in the long term, people must take up a particular attitude of mutual respect and recognition towards each other. The freedom to insult others' central beliefs is incompatible with tolerance as a moral principle and threatens to undermine it as a social practice underlying the survival of liberal society. The general problem with this argument is that it conflates the personal moral virtue of accommodation with the political virtue of toleration. They are quite distinct: only political toleration is a direct requirement of liberalism that may be legally enforced. At the inter-personal level, accommodating aspects of other people that you don't particularly like is part of the virtue of civility. Between strangers, like fellow commuters, its requirements are somewhat minimal and reciprocal. Between friends and acquaintances it may require careful kindness in respecting each others' idiosyncrasies, and not for example serving bacon at a dinner party to a vegan (or an orthodox Muslim or Jew). But such attentive politeness (niceness) is not the business of the state to prescribe and enforce! Tolerance as niceness is not acceptable as a political principle, not only because niceness is superficial and nebulous, but also because it is insidious and totalitarian. One cannot be commanded to 'love thy neighbour' and still live in a society of free people. A properly liberal polity is not a community modelled on the family. It is not concerned with managing the intimate relationships between people in order to keep everyone feeling happy and equally loved. It doesn't set out to restrain and punish assholish behaviour - whether burning poppies or copies of the Koran - out of fear that such rudeness threatens the delicate bonds that hold society together. Liberalism doesn't take preserving society as the goal but as a means, and has more faith in its robustness. The practical task of liberalism is to promote institutions that allow individuals to live their own lives, including deciding for themselves who to relate to and how. The legal right to insult religion doesn't mean it is the morally right thing to do. But in a liberal society people must be free to be assholes - like Socrates - and its citizens must seek other mechanisms than the law to maintain civility (such as social opprobrium or just not feeding the trolls). It is because liberal societies have a foundational commitment to individual autonomy, and thus to justice and equality, that they generally produce nicer friendlier individuals and societies. The liberal concept of toleration is not a first order moral principle in its own right. (And thus, by the way, liberalism doesn't face contradictions about tolerating the intolerable.) Rather, toleration is a second order regulatory principle developed to manage reciprocal respect for autonomy in a society of free people. It is incorporated into the basic structure of a liberal society and is concerned with restraining government, or anyone else with power, from regulating the disagreeable views and beliefs of individuals (cf. Furedi on Tariq Ramadan). Liberalism gives us the right and freedom to judge what other people say for ourselves; toleration stops us from acting on our judgements to summarily silence those we disapprove of. In other words the liberal concept of toleration cannot be drawn on to justify censorship of what some people find offensive, whether that has to do with religious impiety or posting revolting jokes on Facebook. It commands, um, toleration. Obviously very few of the groups and states campaigning to ban blasphemy take these liberal arguments seriously, i.e. as embodying principles binding on their own behaviour. They are merely rhetorical devices to use as cover for the political projects of asserting authority over religious believers and religious doctrine, suppressing internal diversity, and so on. Perhaps liberals should be flattered that conservative reactionaries nowadays feel the need to dress up their odious goals in the language of respect for individual rights. But it is rather worrying how easily they are able to do so. The arguments I have analysed and rebutted as illiberal are all truisms of the mainstream left. They are products of the project that has become known as political correctness, in which society is viewed as a living organism which may be perfected by top-down institutional engineering. (Confusingly, in America this is called liberalism.) The wave of ridiculousness now sweeping across college campuses, first in America and now Europe, in which students seek to protect themselves from the trauma of hearing disagreeable views and ideas is the latest iteration of this project. That project deserves its own critical treatment. I will only point out that the ease with which these arguments of the left can be turned to support reactionary conservatism suggests that something fundamental has gone wrong. * To be clear, throughout this essay I have been speaking of the ideal of a liberal state that no country yet meets Many European countries, for example, still have laws defending society against blasphemy and other desecrations. The arbitrariness of such laws, and especially the ease with which they can be used to suppress minorities, supports my line of argument. Britain's laws against offensive speech, for example, were used against Muslims trying to protest the British occupations of Iraq and Afghanistan by burning poppies, a sacred symbol of British militarism.) Nevertheless, even if they still have some way to go, some countries, like America, are clearly more liberal than others, like China or Ethiopia. This is a heavily revised version of a post originally published in 2012.